A venue is a named location or address/geo that is typically used for checkins. 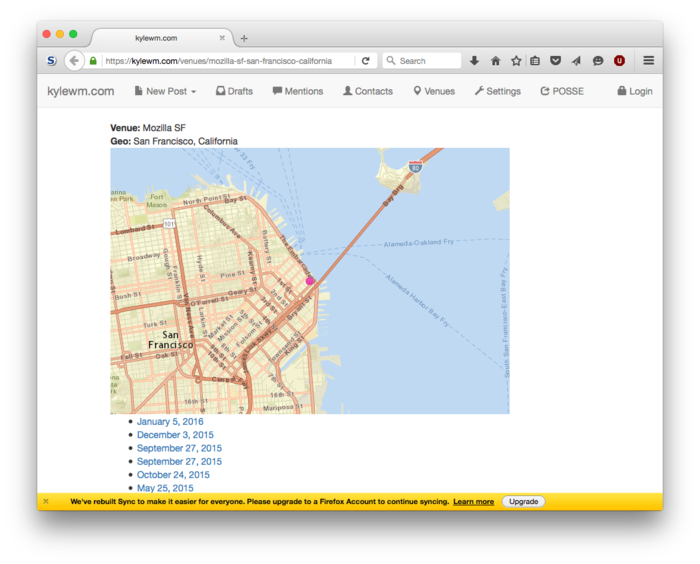 indieweb venues are the practice of self-hosting checkin venues (self hosted venues) on your own site with your own URLs. You should host your own venues with your own URLs for all the usual longevity reasons, but also to give yourself the freedom of defining new venues by your own experience, not just by someone else’s map. Give each venue a URL containing a basic h-card. In this regard, a venue is kind of a special case of a wiki-page in that it is more of a timeless page than a post that has an explicit published date. More "How to" TBD, see #Brainstorming. gRegor Morrill has been publishing venues on gregorlove.com since 2015-11-12. 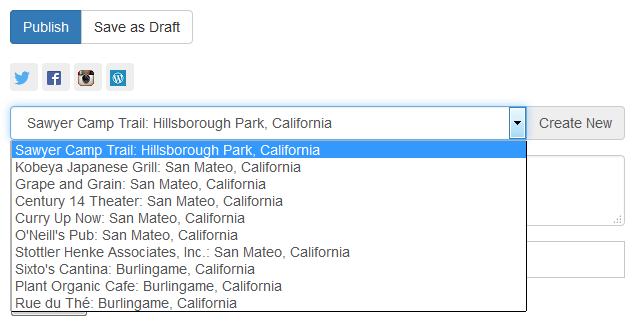 Currently publishing each venue name, address, and URL with h-card. The events I publish then link to this URL to indicate the location. Amy Guy has been publishing 'venues' on at rhiaro.co.uk/locations since 2015-12-29. They're not real places, but a list of vague places I check in to (home, office, etc). Only contain name and description. Marked up with h-cards but also available as ActivityStreams2 Collections in JSON-LD and turtle. My checkin app burrow reads this list to present me with buttons to tap to check in. Kyle Mahan uses Red Wind to publish venue data on kylewm.com from 2014-10-26 (and manually backported venues to older location-only checkins) until 2016-01-19, and then live again since 2016-?? ?, e.g. list of links to other posts that reference that venue permalink, e.g. checkin and event posts. IndieWeb sites publishing things resembling venues, but not quite separate venue posts yet. travel reminders - it can be particular useful to have your own easily refernceable an editable list of venues for any particular city you might travel, for the purposes of personal curation, places you want to see/try, or places you want to return to. Whether sites, museums, or cafes, restaurants, etc. Foursquare tips attached to those venues. Indieweb transition strategy: import said Foursquare tips semi-automatically into indieweb venue URLs when said URLs exist and have rel-alternate URLs to equivalent Foursquare venues. A possible mp-venue query could be added to Micropub to support a client querying a site for venue URLs to display based on provided information(usually latitude, longitude, or keyword search). User B is in the same area and sees the checkin. They decide to go to the same place. User B has a browser extension which parses checkin pages for h-card markup, and displays a “Check in to this venue on your site” button. They click it. How to find a silo venue URL equivalent, i.e. "How would you find the FB version of a venue?" Your own venue URLs's representative h-card have u-url venue equivalent URLs for Foursquare, Facebook, Twitter etc. 90% case: import your Foursquare and Facebook checkin history and create indie venues for all silo venues from the import. Then since most of the time you visit where you've already been, this handles the indie venue / silo venue connection for that part. Experience with Foursquare's "community generated/patrolled venues database" is that a few griefers can pollute/damage the data quite badly, with deletions, overmergings etc. Sad to say, same thing happens with Wikipedia (excessive deletions, overmergings). Thus little hope that a "community hosted venues database" wouldn't have all the same problems, if not worse. This page was last edited on 4 August 2017, at 02:45.